And now to the important stuff… What’s On This Weekend! 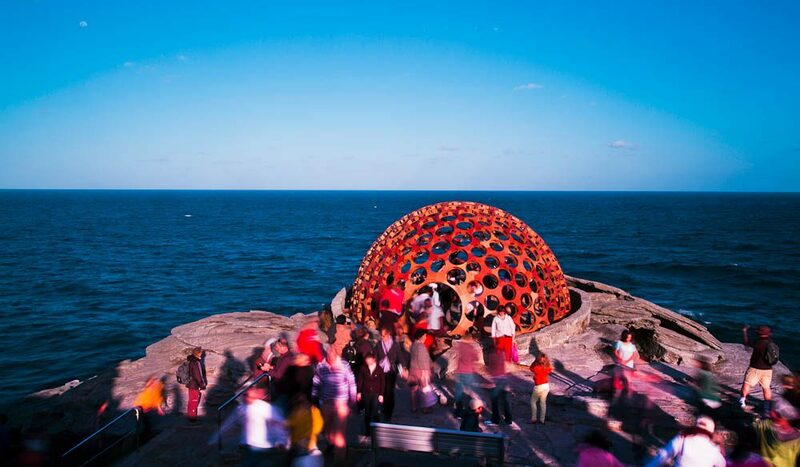 Sculpture by the Sea returns to Bondi this weekend (photo: Brett Winstone). Australian Traveller has been scouring the country for chic, energetic and epicurean ways to spend this weekend. Enjoy! The world’s largest outdoor sculpture exhibition, Sculpture By The Sea, returns to our shores on the Bondi to Tamarama coast walk. The beautiful stretch is transformed into a two-kilometre sculpture park featuring more than 100 artworks from Australia and across the world. 24 October to 10 November. Concert season has begun in the Valley and all the cool cats are heading to Jazz in the Vines. Tickets for the Tyrell’s Winery event are on sale on the day and, at this stage, it is not expected to be affected by the bushfires. 26 October. Creative surfy culture is in sharp focus at the annual Byron Bay Surf Festival. Photography, art, music and markets draw on Byron and Australia’s surfing heritage in this gnarly three-day event. 25-27 October. In need of some artistic inspiration and engagement? Semi-Permanent is an art and design gala featuring “the world’s most talented creatives” from fields such as photography and illustration. Part visual, part party, ‘visionaries’, such as Melbourne photographer Nicole Reed, will share insights and anecdotes. 25-26 October. Melbourne’s most talented ‘gelato artisans’ vie to delight you and the judges’ tastebuds with their signature flavours, with the victor heading to the Grande Finale of the Gelato World Tour next year in Italy. Part of the Carlton Italian Festa, the event encompasses lessons on the art of gelato making, taught by instructors from Carpigiani Gelato University. Tasting is mandatory! 25-27 October. Hop across from Brisbane for Island Vibe, a three-day art, food, craft and music festival on ‘Straddie’. Three stages of reggae, roots and soul music are bound to create an even more laid back vibe, man. Make sure you look into accommodation or book your return trip in advance. 25-27 October. McLaren Vale hosts the finals to the “world’s richest landscape painting prize”, The Fleurieu Art Prize, which kicks off this weekend. Sup fine wines and snack on gourmet foods while you enjoy and critique international and local artists at various venues around McLaren Vale. Until 25 November. Two-thousand shimmering candles illuminate Canberra’s Nara Peace Park & Lennox Gardens (behind the Hyatt Hotel), celebrating 20 years of the capital’s Sister City relationship with Japanese city Nara. The festival showcases a cross-section of culture including music (from Australia’s Got Talent George Kanikawa and Noriko Tadano among others), calligraphy, lantern making, origami, kite flying and, of course, cuisine. 26 October, 4.30pm – 9pm.